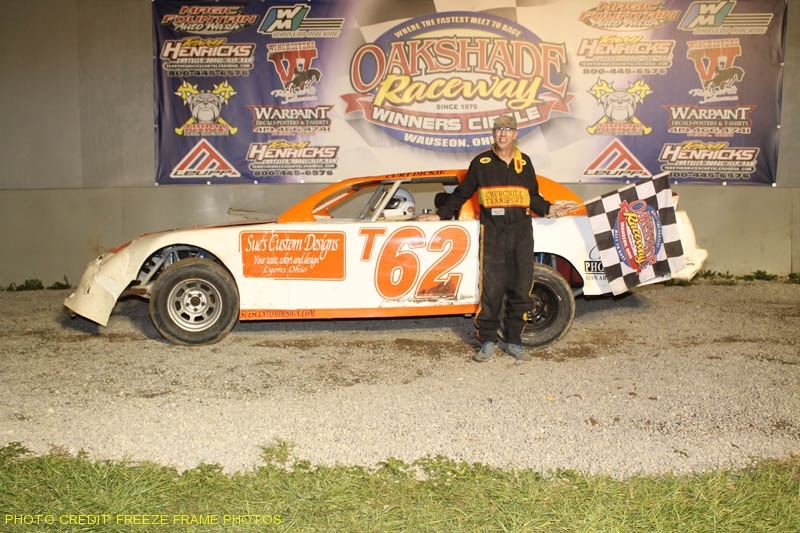 Defending Oakshade Raceway Champion Rusty Schlenk picked up his first win of the season Saturday on Wallace Racing Products Night and John Brooks soldiered his way to a 200-lap Enduro win on Sunday afternoon. Dona Marcoullier entered Saturday night’s competition with the Oakshade Raceway UMP Late Model points lead thanks in part to his two feature wins earlier this season. He would end up starting in the tenth position in the Wallace Racing Products feature event. Ken Hahn started on the pole and led the first portion of the race. Ryan Missler and Rusty Schlenk closed in on Hahn and the three drivers battled for the lead. Missler and Schlenk got together a bit on the backstretch, but were able to continue on without losing any positions. By lap seven, Schlenk managed to pass Hahn and take command. Missler began to chip away a bit on Schlenk’s lead while working through lapped traffic. A couple cautions with around 10 laps remaining allowed Marcoullier to improve his position up to third, but that would be as far he would get. Missler got along side Schlenk and raced him for the lead in the latter stages of the race, but Schlenk would go on to pick up his first checkered flag of the season. Missler settled for second and Marcoullier’s third place finish was good enough to maintain a 30-point advantage over Schlenk in the point standings. Chris Keller posted a fourth place finish with Casey Noonan taking fifth. The most exciting feature of the night was that of the UMP Sportsmen. Bruce Stuart led at the start of the race and led the first half. Bob Gregory and Tim Line caught Stuart and the three raced three-wide for the lead. Stuart ended up losing the lead when he spun on lap 10. That left Gregory and Line to duke it out with some more side by side racing for the top spot. The two drivers exchanged the lead multiple times while continuing to race door to door lap after lap. Mike Jessen didn’t want to get left out and joined the battle for the lead making it three-wide again. Those three drivers came off the final corner with the checkered flag in sight three-wide. Gregory narrowly edged out Line for the win on the outside with Jessen finishing a close third on the inside. Jamie Grochowski ended up fourth and George Lindsey came all the way from the 18th starting position to finish fifth. Jeff Foks had the dominant car in the Wallace Racing Products Bomber A Main. He led the entire distance of the 15-lap feature after starting on the outside of the front row. Gregg Detray ran second most of the race, but could not mount a significant challenge on Foks. Detray did manage to fend off Terry Rushlow and Adam Noonan who made it a three-wide battle for second at the finish. Rushlow ended up just ahead of Noonan for third. Following Noonan in fifth was Chris Sands who started deep in the field. Next up was the four-cylinders of the Hornets and Sport Compacts. Fourteen-year-old Cody Laney picked up his fourth Hornet feature win in a row with William Cundick second and Breanna Franks third. “Sparky Marky” Gillingham got the early advantage over Austin Casteneda in the Sport Compacts and began to slowly pull away until the final lap. After taking the white flag, Gillingham’s car suddenly slowed on the backstretch which allowed Jerry Hoot to close in. Gillingham was able to get the car back under power and barely held on to pick up the victory over Hoot, Cory Gumm Casteneda and Regan Ford. Mike Grames was in command of the first half of the Wallace Racing Products Bomber B Main until he spun while leading on lap eight. That would have turned the lead over to Tim Line who had started a bit to early on the previous restart and was penalized two positions back to third. That put Terry Rump and Derek Zuver ahead of Line in a late race restart. Line disposed of both Zuver and Rump and came all the way from the back row at the start to win the B Main. Rump held on to finish second with Mathew Chapman getting by Zuver for third. Shaun Sharp finished fifth. Duane Fletcher started on the pole of the Wallace Racing Products Bomber C Main and maintained the lead until lap five when Bill Reeves Sr. got by. Reeves went on to pick up the C Main victory with Joe Hefner taking second. Fletcher slipped back to finish third followed by Mike Draper and Maverick Wright. The endurance testing 200-lap Enduro hit the track on Sunday afternoon with Ronnie Bloomfield Jr. leading the field at the start. Mark Henderson quickly took over the lead early on, but relinquished it to John Brooks by the 50 lap mark. Brooks led Henderson and Bloomfield from lap 50 to past the halfway point. That was when Henderson started to fall back through the running order after a series of visits to the pits. Bloomfield then took over second and continued to run there despite a few troubles with spins going in to turn one. Without any stops in the pits, Brooks was able to dominate the race and survived a near disaster late in the race after brushing up against the front stretch wall. It was his first Enduro win of the year. Bloomfield settled for second finishing 12 laps behind Brooks. Colin Walker, Jeremy Grover and Brad Gilbert rounded out the rest of the top five finishers. Another full program of UMP Late Model, UMP Sportsman, Bomber, Hornet and Sport Compact action will be on tap for Saturday, June 15 at Oakshade Raceway. Gates open at 4pm with racing at 7pm.